Have you ever wondered why some people seem to rise effortlessly to the top, while others are stuck in the same job year after year? Have you ever felt you are falling short of your career potential? Have you wondered if some of the things you do–or don’t do–at work might be hamstringing your ambitions? 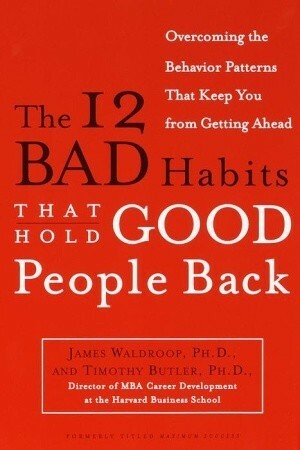 In The 12 Bad Habits That Hold Good People Back, James Waldroop and Timothy Butler identify the twelve habits that–whether you are a retail clerk or a law firm partner, work in technology or in a factory–are almost guaranteed to hold you back. The fact is, most people learn their greatest lessons not from their successes but from their mistakes. The 12 Bad Habits That Hold Good People Back offers the flip side to Stephen Covey’s approach in The 7 Habits of Highly Effective People, zeroing in on the most common behavior that can impede a career. Based on over twenty years of research as business psychologists, the authors claim that the reasons people fail in their jobs are the same everywhere. Only after these detrimental behaviors have been identified can the patterns that limit career advancement be broken. Using real-life accounts of clients they have worked with at Harvard and as executive coaches at such companies as GTE, Sony, GE, and McKinsey & Co., Waldroop and Butler offer invaluable–and in some cases, job-saving–step-by-step advice on how readers can change their behavior to get back on track. For anyone seeking to achieve his or her career ambitions, The 12 Bad Habits That Hold Good People Back is a powerful tool for unleashing true potential.